My daughter really wanted to be a ballerina for Halloween. BUT being the #craftymom I am, there was no way that I was going to throw a tutu on her and call it done! 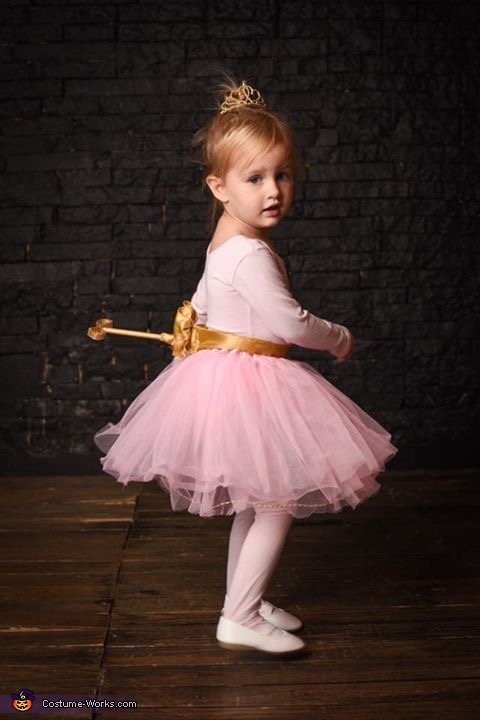 That's when I got the idea that she could be a "wind-up" ballerina, just like the one in her jewelry box. For the main part of the costume: She already had a pink tutu in her dress up box, which I added gold wire to in order to make it "stick out" more. I purchased a pink leotard from a garage sale for a whopping 75 cents and bedazzled the top with gold jewels that I had in my craft box. I then took one of her dress up tiaras and went back to the craft supplies for some gold glitter paint! For the functioning Wind-Up Key and Music: I painted a wooden dowel and an old ribbon spool with my gold glitter paint. I then squished the spool and hot glued it onto the dowel to make the "key". Next, I disassembled her beloved jewelry box (don't worry, I will put it back together now that Halloween is over) and took out the little music box. I attached wire through the dowel and wrapped it around the turn knob of the music box so that it was all one piece, wrapping the bottom portion in gold ribbon to hide the original knob and wire wrapping. I attached all of that to a piece of elastic that would be tied around her waste. Finally, I made a bow that I attached to gold ribbon that would clasp in the back around the music box to hide the whole contraption and make it pretty! To top it all off, I taught her to dangle her head and arms until I would wind her up, when she would "come to life" and do her ballet twirl on her tippy-toes. Of course everyone loved it, and by everyone, I specifically mean her grandparents :) She was so excited and jumped at the chance show everyone who would watch her dance! She would not stop spinning until the music stopped playing!